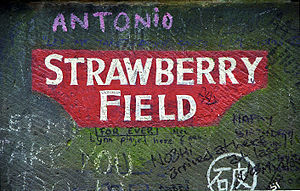 Strawberry Field was a Salvation Army children's home in Woolton, a suburb of Liverpool, England. The earliest reference to 'Strawberry Field' dates from 1870. In 1912 it was transferred to a wealthy merchant whose widow sold the estate to the Salvation Army in 1934. It opened on 7 July 1936. The name of the home became world famous in 1967 with the release of The Beatles single "Strawberry Fields Forever" written by John Lennon. Lennon grew up near the home - one of his childhood treats was the garden party that took place each summer on the grounds of Strawberry Field. Lennon's Aunt Mimi recalled: 'As soon as we could hear the Salvation Army Band starting, John would jump up and down shouting "Mimi, come on. We're going to be late. He and his childhood friends Pete Shotton and Ivan Vaughan often played in the wooded area behind the building, which Lennon nicknamed in the plural "Strawberry Fields.